Spy Camera Remote Control and Motion-Activated Function! Electric Toothbrush Function properly as usual, without any distinction. Compare to the first generation of spy toothbrush camera, this new Pinhole Spy Toothbrush Hidden Camera DVR 16GB(motion-activated) has an advanced usage. Its resolution is up to 1280x720. 16GB memory included. There is a mini digital spy camera hiddens inside the beautiful electric toothbrush. 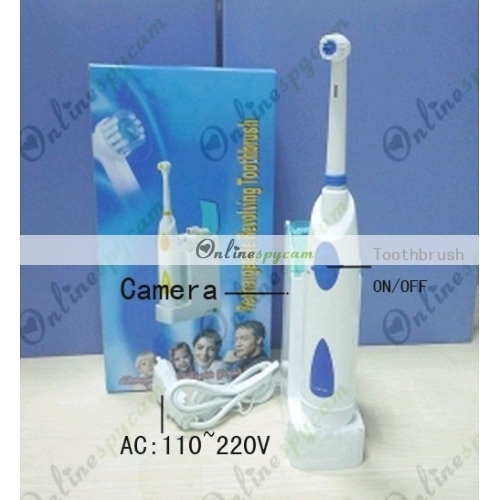 Its appearance looks like an ordinary toothbrush, but it has a wonderful recording function. You can brush your teeth and at the same time record everything you are interested in. It is so secret that no one knows where the camera exists even when it works. It doesn't need any external plug-in card, because it has a memory card of 16GB built in. This new generation bathroom spy camera can work for a long time. Its battery capacity can work about 8-10 hours. From this fine spy camera, you can get the most authentic and clearest evidence for a variety of illegal behaviour. Ideal for CIA agents, police, detector, and spy agency. Support PC Camera. bathspycamera.com HD Pinhole Camera Electric Toothbrush Hidden Spy Camera DVR 16GB (motion activated)- Spy Camera Remote Control and Motion-Activated Function! Electric Toothbrush Function properly as usual , without any distinction. Important feature of this camera , compare now! 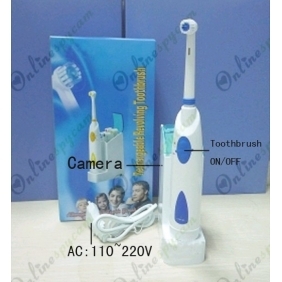 Description: Compare to the first generation of spy toothbrush camera , this new Pinhole Spy Toothbrush Hidden Camera DVR 16GB(motion-activated) has an advanced usage. Its resolution is up to 1280x720.